Meridian Electric Ltd. provides on-site maintenance and inspection services as well as in-shop inspection of overhead lifting ,hoisting and rigging equipment. Hoist and crane installations are certified and stamped by a Professional Engineer where required. All work conducted by Meridian Electric Ltd. meets or exceeds any guidelines and/or regulations (CSA, OH&S, ASME & ANSI, etc.) 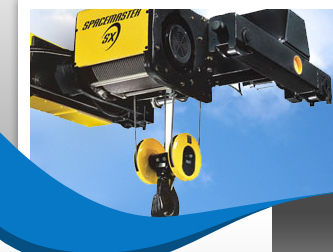 specific to the building, maintaining and installation of lifting equipment. Meridian Electric Ltd. provides 24 hour service to our customers in order to reduce lost time and ensure safe and productive work environment. Meridian Electric Ltd. provides certified inspection and maintenance services for most brands of overhead crane and hoisting equipment. Inspection services are provided by certified inspection teams. Maintenance is conducted with only manufacturer recommended spare parts, specifications & procedures, and/or engineering approval. Meridian Electric Ltd. provides one point of contact to ensure all your inspection and maintenance requirements are satisfied. Minimize production loss due to equipment failure. Minimize repairs costs (finding problems before they become a major expense). Minimize accidents caused by poor equipment condition.